HEY APATHY! 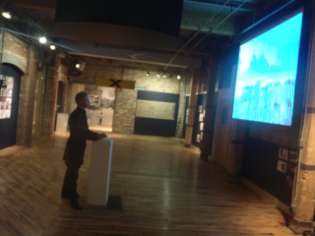 “The Virtual Metropolis” is an interactive video installation combining traditional ink drawings and stop motion animation with cutting edge gaming technology. 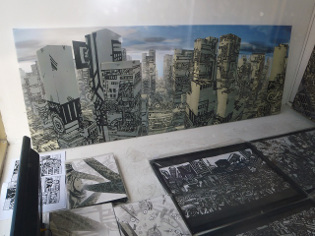 The artwork features various intermingled imaginary environments including cityscapes, factory districts and war zones. The user is invited to explore these worlds, seamlessly moving from one area to next, to discover satirically iconic animations and imagery. The metropolis is overrun by scurrying denizens and giant billboard depictions of man’s cybernetic assimilation with hand-held devices while the war zone is enveloped by skeletons, bombs, and faceless people falling from the sky. Conceptually the work emphasizes the immediate connections each environment has with each other while using humorous vignettes to express discontent towards a virtual world not too dissimilar from our own. As with the imagery, the installation itself is designed to challenge a predominant consumerist ideologies, questioning notions of self righteous alienation. Not only does the game explore the relationships which exist between man, technology, progress and the natural environment, but the interface emphasizes the role of the individual by offering a unique interactive experience. Using a standard video game controller the user can explore and affect the artwork; a semiotic acknowledgment of the importance and potential behind the actions of anyone who chooses to get involved. Through the amalgamation of fine art and commercial software the “Virtual City” has become a vehicle which questions the current state of civilization while accepting progressive frontiers. The project expresses philosophical and social concerns traditionally associated with academic circles while subverting a platform primarily used in the public sphere. Transcending mere cultural criticism we aim to discover new ideas through the creation of a work simultaneously intellectually provocative as well as accessible to audiences of all ages. "The HEY APATHY! 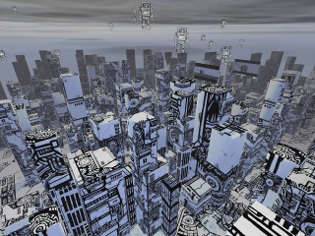 Virtual Metropolis" is a collaborative creation developed by fine artist Mike Parsons and video game programmer Michael Peters.